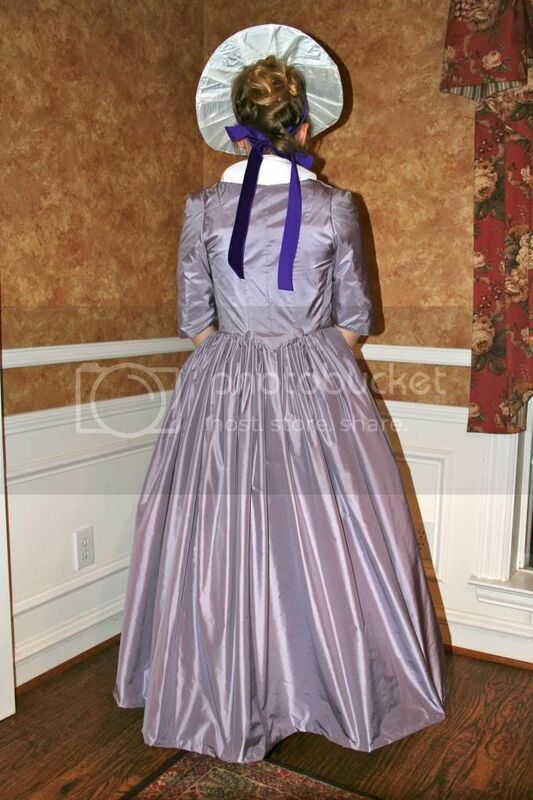 I made this dress specifically to fit into the 1780's or 90's, giving me the opportunity to use the zone front design I love, which was very popular in the late 18th century. I draped my own pattern for the dress, but did make some changes to my original inspiration. I opted for the shorter sleeve because sleeve pattern design is a huge challenge for me, and I didn't get to use a belt because it ended up cutting my waist in a visually unappealing way. I chose lavender and white as my color scheme, because I love any shade of purple, and used silk taffeta for my fabrics with a linen lining. I hand sewed the entire garment and tried to research and particularly pay attention to techniques and stitches that were historically accurate. I covered a straw hat with matching white silk and trimmed with matching purple lavender silk. The dress is worn over a shift and stays for period shaping. The skirts can be looped up, which is an option I particularly love! I chose to do the 18th century because it's my favorite time to sew for! My other "favorites" in this outfit would be the zone front, the colors, and the silk fabric! Hand sewing it all - well done! This dress looks lovely on you :) I'm keen to try a zone front myself - thanks for sharing your progress in your blog for us to follow. I love zone front dresses too, and yours is a really lovely example! The lavender colour really suits you and I really admire your commitment in hand sewing it all!